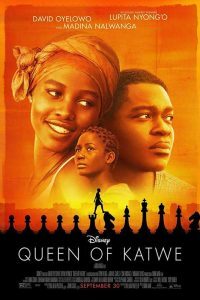 Queen of Katwe tells the inspirational, true story of Phiona Mutesi, a young girl from the slums of Uganda who becomes an international chess master. Based on a story in ESPN: The Magazine, the movie follows the story of Phiona over five years. Phiona lives with her mother Nakku Harriet (Lupita Nyong’o) and her siblings in terrible squalor. One day Phiona sees a man named Robert Katende (David Oyelowo) teaching children to play chess. He is also feeding the children cups of porridge. Intrigued, Phiona comes in the shed, along with her brother. Phiona is captivated by the game and begins to play. Teased by some of the boys because of her gender, Phiona persists in chess and eventually defeats them all. Robert recognizes Phiona’s great talent and begins to take her, along with her teammates, to tournaments, first in Uganda, then to other African countries, and even as far away as Russia. In one sense, there is nothing particularly new about the story. The audience will expect up’s and down’s in Phiona’s journey. Nakku is at first suspicious of Robert’s motives, then wonders if all the travel and international championships are helping her daughter, who must come home to dire poverty. When the team from Katwe (a very poor neighborhood) play children from a private school in a wealthy neighborhood, the audience knows the Katwe team will be treated in a condescending manner, but ultimately show up the rich kids. Yet, other than seeming like merely a heartwarming TV movie, Queen of Katwe is enriched with a great sense of place and authenticity. Indian director Mira Nair brings out the rich colors and music of Uganda in the photography, sets, and costumes. Yet, Nair never romanticizes the poverty of Phiona and her family. For most of the time period of the film, the family lives in a bare house without a roof and little furniture. When the monsoons begin, the little they have is washed away. Like the best stories, Queen of Katwe has universal values rooted in a particular time and place. Furthermore Queen of Katwe is bolstered by excellent performances by Oyelowo (who played Martin Luther King in Selma) and Oscar winner Lupita Nyong’o. Robert, a football player who had to give up the sport due to an injury, is a competitor, who inspires the youngsters to do their best at chess. Nakku loves her children and wants them to succeed. Yet the daily struggle of the poor to provide shelter and food for her family is etched in her tired face. Nakku is a proud and dignified woman who will not just “get herself a man” as neighbors suggest and her older daughter does, to provide food and shelter. Finally young Madina Nalwanga plays Phiona as a serious, intelligent, and dedicated chess player. Yet, she is not without flaws, as when she thinks she is too good to do household chores after winning a trophy. It’s also nice to see a movie in which the characters pray. Prayer isn’t over-emphasized, but we do see the characters pray. Robert works for a Christian ministry, although it’s not clear which one. Still, it’s good to see this reference. At the end of Queen of Katwe spontaneous applause erupted in the audience. I think it will make you want to applaud too. As with the recent Sully, I’d advise you not to leave the theater too soon. When the credits roll, the audience gets a chance to see the real people who inspired the movie, alongside the actors who portrayed them so well.